I am having one of those weeks where, after a heaving reading weekend, I find myself not even tempted to pick up a book in the evenings. However, since my alternate evening activity is catching up on series 3 of Borgen, I’m not feeling the loss too keenly. And once I’m caught up on my television watching, I have some truly excellent books waiting for me! Old Filth by Jane Gardam – after my first, excellent encounter with Gardam (A Long Way from Verona, which I will finish reviewing eventually) I could not wait to read more from her. Gran-Nannie by Noel Streatfeild – Recently reissued as Tea By the Nursery Fire, Hayley reviewed this just a few days ago and has me even more excited to read it. An Accomplished Woman by Jude Morgan – my favourite of Morgan’s Regency novels. The inter-library load system came up trumps this week. I put both these requests into the system with very little hope that they would be able to find them. But, lo and behold, the books are here in my hands. If my allegiance to the library had ever been in doubt, they’ve clearly got it for life now. 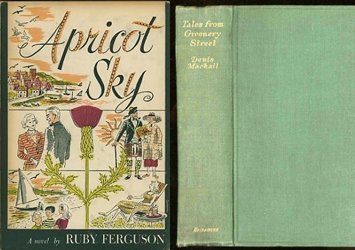 Apricot Sky by Ruby Ferguson – Scott’s inclusion of this on his (fabulous) “Possibly Persephone” list and his description of it as “the best approximation I’ve found of a D.E. Stevenson novel not written by Stevenson herself” made it obvious that I had to read it. Tales from Greenery Street by Denis Mackail – I finally get to read about Ian and Felicity’s Greenery Street neighbours! Enjoy watching your series and reading your books. I have Tales from Greenery Street from the college library … It would have been too too hard not to have more of the first book! It would have been! I know there’s one more book (Ian and Felicity) but I have little hopes of tracking that done…but, given how well I’ve done via ILL so far, who knows? 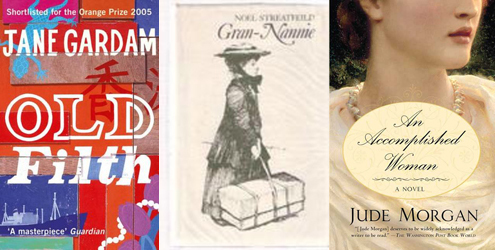 I didn’t know there was another Greenery Street book – must look out for that one. I’m very curious about the Streatfeild book as well. Great loot this week! I’m reading from home currently and finishing the book that’s been on my shelf the longest, Empire of the Czar by the Marquis de Custine. Also have a bookmark in Edith Pargeter’s Brothers of Gwynedd. Not sure what possessed me to have two tomes on the go at once, but reading is either feast or famine at the moment. Enjoy your loot. There are two more, actually, both very difficult to find these days! Your reading sounds interesting. Enjoy! And you have a lot of great books to choose from. Enjoy! Thanks for the shout-out, Claire. So glad you were able to track down Apricot Sky (I wonder if you have the same copy I had?) and I hope you love it as much as I did! Given how few copies there seem to be floating around (especially on the West Coast), it very well might be the same copy! Mine’s in an orange library binding and is from King County Library in Washington State. I had no idea there was another Greenery Street story! You always have something fascinating in your library book pile, Claire. Given how long it has taken me to track down a copy of this, I’m not shocked people don’t know about the other Greenery Street books! It’s great when a library surprises you by being even more awesome than usual. Enjoy your books when you come down from the Borgen rush. It really, really is great! I’ve got two episodes of Borgen left now and I’m not sure how I’m going to manage when I’m done. Old Filth is wonderful, you will love it. I’m half way through now, Margaret, and I adore it! I’ve been taking my time with both of my current reads as well. Sometimes it is nice to take a little break from reading….it makes it all the more enjoyable when you go back to it 🙂 I hope that you get the chance to enjoy all of these!